Great publicity photo of Frank drawing a live Pongo at the studio. This pic was taken either during or toward the end of production of 101 Dalmatians. There are finished cel set-ups pinned on the story board behind him, as well as a drawing and cel from one of his lovely Perdita scenes. 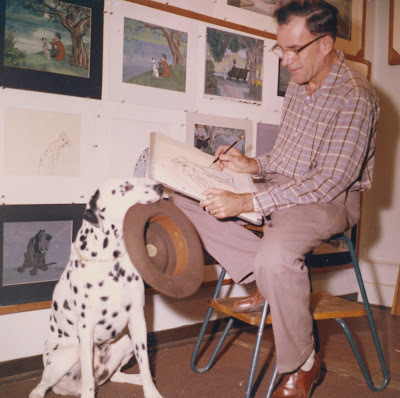 Before Dalmatians Frank had produced beautiful animation featuring dog characters for Lady & the Tramp. One of his key sequences (aside from the iconic spaghetti eating moment) was when Tramp meets Lady for the first time, along with Trusty and Jock. Their character-contrasting interactions are priceless. For 101 Dalmatians Frank animated many scenes with the lead dogs, but also a poignant scene at the beginning of the film, when during the birth sequence Nanny presents an unlucky puppy to Roger Radcliff and Pongo. That puppy was brought back to life through the help of Roger. Later on another one of Frank's heartfelt animation moments is the Dalmatian reunion in the cows' stable. 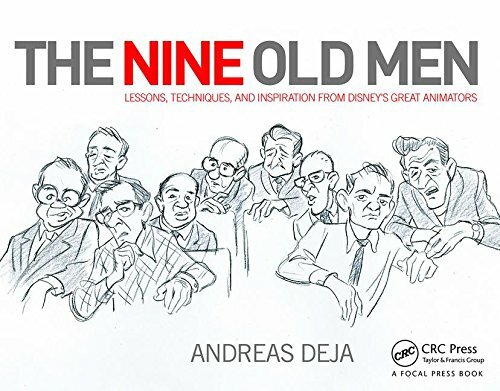 Marc Davis might have stolen the show with his inventive and eccentric animation of Cruella De Vil, but if the plight of the Dalmatian family hadn't been portrayed believably and emotionally the story wouldn't have worked. And Frank Thomas had a lot to do with that.